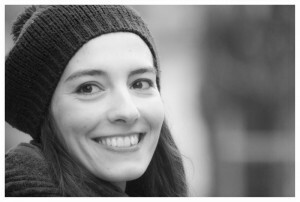 Sara Elena Rossetti teaches English and translates works from English into Italian. She has collaborated on translations of poems by Christina Rossetti, including Goblin Market and The Prince’s Progress. She is also an actor and has worked on various theatre and film projects. Her poem Intorno, illustrated by Alessandro Verdi, was published in 2013. 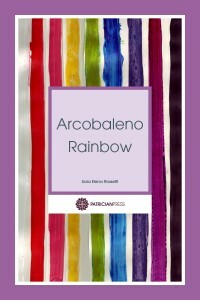 Arcobaleno Rainbow (originally Nell’arco di un baleno) is her first poetry collection. While I was writing this collection, I often thought about the importance of colours in our lives and about how colours often have an impact on our emotions and behaviour. We could represent the events of our lives through a diary of colours, using the strokes of contrasting shades. We sometimes feel blue; we see red; we are tickled pink or colourless; but most of all we are a mix of the different hues that create our personal life. Arcobaleno Rainbow is an attempt to express thoughts and emotions, writing through this array of colours. I’d love to know something about your favourite colours and favourite verses and receive any kind of comments and advice. Please see the comments box below. Arcobaleno – Rainbow was born in 2013 and since then it has followed its own distinctive path, displaying a very independent character and even if it is still a baby, it seems determined to continue going around the world and meeting others. In Spring 2014 Arcobaleno – Rainbow was presented in Milan at Galleria Eroici Furori and in London at Treadwell’s Bookshop, alongside other Patrician Press titles. 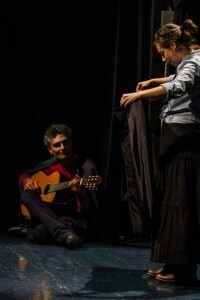 Various poems have been read in Milan on several other occasions, for instance, at Har Baje and at La Casa delle Culture del Mondo in a music performance, together with songwriter Giovanni De Cillis. In 2013 a beautiful small book was also published by Edizioni Pulcinoelefante, using part of a poem from Arcobaleno Rainbow, entitled Fil Rouge. Roberto Bernasconi collaborated and created a very elegant design and layout. The book was printed in 25 copies in Osnago using the magic movable type printer at Alberto Casiraghi’s studio. or see it more than once. we don’t tell anyone else. 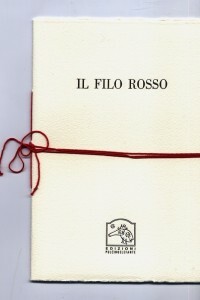 Fil rouge was also mentioned in Vanessa Aloise’s degree thesis about Edizioni Pulcinoelefante. Then in 2014 one poem, The tablecloth, was used by director and playwright Rino Cacciola for the show: Jack and the magic plant (adaptation of Jack and the Beanstalk) performed by Favola di Mattoni with sets by Nicola Console. The poem was set to music by Cacciola himself and beautifully sung by actress Sandra Manzo. we will use to lay our table! This year there has been other good news. 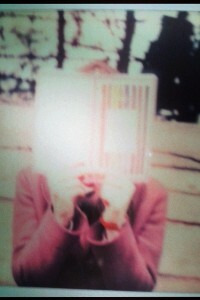 Some poems were read in Vernasca and in Milan. Furthermore, an English teacher, Margherita Fretto, is using some poems from Arcobaleno Rainbow for her classes at Liceo delle Scienze Umane B. Russell in Garbagnate Milanese. Soon, Arcobaleno is also flying to Texas, where Caterina Ziliani, Italian teacher, is going to use it to teach Italian to her pupils at Bellaire High School in Bellaire.